To celebrate your arrival, the Political Science, Economics, and History Students Associations have planned an epic party for Friday the 20th at Bar Le Saint-Sulpice, 1680 Saint-Denis Street. There will be unlimited beer, yes unlimited, at least from 9 to 10 PM. This event is a great occasion to meet people who have similar passions and generally have fun with fellow History, Economics, and Political Science students. Tickets are a mere $3 considering that beer will be unlimited. 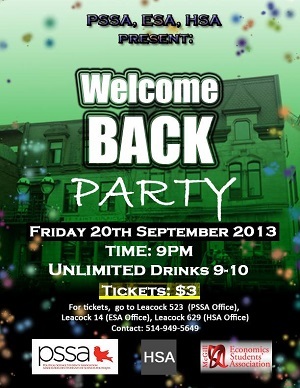 To buy tickets, come to the HSA office (Leacock 629).